Experience grounded in community; fueled by expertise, knowledge and understanding, and backed with data. Dimension Strategies steers the design and execution of winning campaigns. We cultivate and shape our strategies from the ground up, focusing on communities, grassroots outreach and digital contacts, and use data-driven decisions to offer our clients the most informed choices. Our decades of experience working with local, regional and national Latino communities, as well as our partnership with the nationally-recognized Latino Decisions research group, gives us acute insight into our country’s fastest growing electorate. Additionally, we offer our clients a deep understanding and knowledge of women voters; energy issues; environment and climate change policies and reproductive rights and health care issues across urban and rural areas, and guide our clients through fundraising strategies to ensure they meet their financial goals and report them accurately. Experiencia basada en la comunidad; impulsado por expertos, el conocimiento el entendimiento; y soportado con datos. Dimension Strategies dirige el diseño y ejecución de campañas ganadoras. Cultivamos y modelamos nuestras estrategias desde cero, enfocándonos en comunidades, enlace comunitario y contactos digitales, y usamos decisiones basadas en datos para ofrecer a nuestros clientes las opciones más informadas. Nuestras décadas de experiencias de trabajo con comunidades latinas locales, regionales y nacionales, así como nuestra asociación con el grupo de investigación de Decisiones Latinas, reconocido a nivel nacional, nos da una visión precisa del electorado con mayor crecimiento en nuestro país. Además, ofrecemos a nuestros clientes una profunda comprensión y un relativa a la energia de mujeres votantes; la política concerniente a la energía, el medio ambiente y el cambio climático; y los derechos reproductivos y las cuestiones de salud en áreas urbanas y rurales, y guiamos a nuestros clientes en las estrategias de recaudación de fondos para asegurar que cumplan sus metas financieras y que las reporten con precisión. Katherine began her career as a school teacher in Denver, and worked in local government for Denver Mayors Federico Peña and John Hickenlooper. She worked for the Departments of Transportation and Energy in the Clinton Administration and was Chief of Staff to Labor Secretary Hilda Solis during the first two years of the Obama Administration. Katherine joined the Obama 2012 Campaign as its National Political Director. On November 4, 2013, Katherine Archuleta was appointed by President Barack Obama to be the first Latina to the lead the US Office of Personnel Management. Overseeing the Human Resources management of the entire federal government, Ms. Archuleta was responsible for the recruitment, hiring, development and support of federal workers throughout the country. Accumulating nearly 20 years in public service along with leadership roles in the nonprofit sectors in both Colorado and New Mexico, Ms. Archuleta has been recognized nationally and locally for her dedication to supporting the role of Latinos and women in public and private sector leadership roles. In 2016 she partnered with national pollsters to assess views and opinions of the Latino electorate in Colorado through her company, Latino Data Project. She serves as a Trustee to the University of Denver and the Swanee Hunt Foundation and is Board Chair of Colorado’s Latino Leadership Institute. Tony has over three decades of experience in environmental and progressive politics – providing strategic advice, managing campaigns, raising money, and coordinating advocacy efforts at the national, state and local level. From 2005 through 2010 Tony served as the Senior Vice President of Political Affairs and Public Education of the League of Conservation Voters. There he built the data department and oversaw the integration of digital communication and social media into electoral, advocacy and accountability campaigns, modernizing the organization. He built a field infrastructure in key states and broadened the organization beyond a reliance on paid media. Tony continues to provide strategic advice to environmental and progressive groups on building power to achieve policy changes needed to advance their agenda. Tony runs programs that rely on analytics to measure impact and effectiveness. Prior to his work at LCV Tony was the Executive Director of Colorado Conservation Voters and was the Director of Environmental Affairs in the Denver Mayor’s Office. Tony currently serves on the board of directors for NARAL Pro-Choice America. Dusti Gurule is an accomplished executive leader with more than 20 years of national, state and local public sector and nonprofit experience. She has an extensive track record in collaborative leadership, strategic planning, public relations, organizational management, public engagement and coalition/partnership building. From September 2010 to January 2017, Dusti served as a political appointee under the Obama administration, representing the U.S. Secretary of Labor in a seven state region where she developed connections between community based stakeholders and federal, state and local entities. 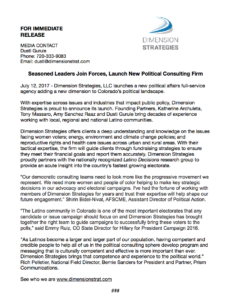 As the founding Executive Director of the Latina Initiative in 2004, Dusti built the organization to a nationally recognized civic engagement and leadership entity, launching partnerships that resulted in programs like Colorado Latina/o Advocacy Day and Latinas Increasing Political Strength (LIPS). Dusti has received numerous awards and accolades for her leadership in civic engagement and community building. Congressional Campaign Committee. Amy worked two cycles at the DCCC. We collaborate with our research partner Latino Decisions to provide our clients with polling and data analysis. Latino Decisions is the leader in Latino political opinion research, and leverages a unique combination of analytical expertise and cultural competencies that are unparalleled in the industry. The Latino Decisions team is comprised exclusively of credentialed research scientists with established publication records, rigorous methodological training and experience with large-scale collaborative research projects. With one of the largest bilingual interviewing staffs in the Western United States, Latino Decisions has the capacity to conduct polls in English, Spanish, Mandarin, Cantonese, Vietnamese and Korean. Latino Decisions utilizes their professional insights and specialized technical skills to produce the most accurate information about Latino political attitudes, experiences and engagement. Information about the firm can be found at their webpage. See also DATA to view our latest research partnership.